This delicious creamy curried cauliflower soup takes just 10 minutes to make in the blender, and is an amazing vegan, gluten-free, paleo-friendly dinner. This delicious creamy curried cauliflower soup takes just 10 minutes to make in a high-speed blender, and is an amazing vegan, gluten-free, paleo-friendly dinner. 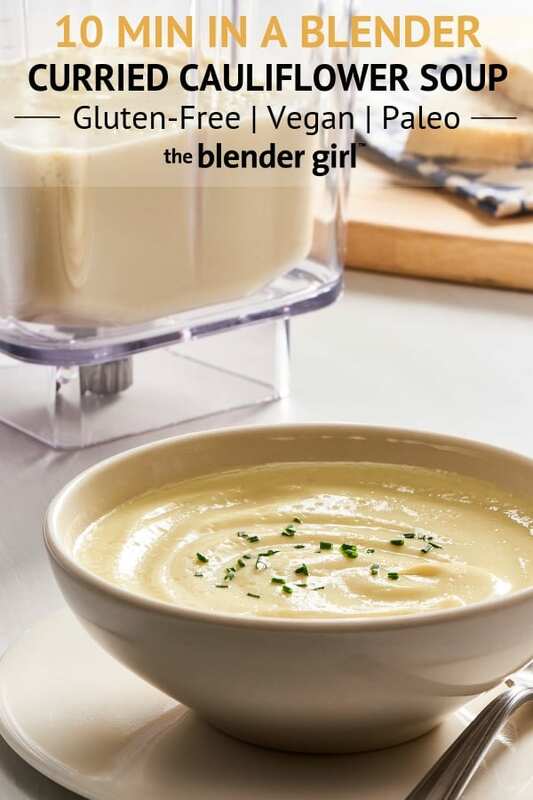 I have received hundreds of emails about the Creamy Cauliflower Soup from The Blender Girl cookbook over the years. It is still one of the top five most popular recipes on the site. It only takes 30 minutes to make, and it is always a show-stopper. But, I wanted to make it even easier for you! Many of you have emailed or reached out on Facebook asking for an easy curried cauliflower soup recipe that can be made in your high-speed blender. I get a lot of requests for soup recipes that can be blended and heated from raw or cooked ingredients in a blender. I know many of you have purchased the KitchenAid Pro Line® Series Blender or High Performance Series blender and are excited to get more soup recipes for easy dinner ideas. 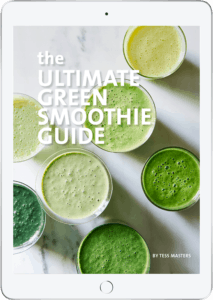 When you’re making soups from raw or cooked ingredients in a high speed blender you combine ingredients differently than traditional soups that are simmered on the stove top or made in a pressure cooker. Because the friction heat of the blades heats the ingredients in only five minutes but doesn’t cook them for an extended period you don’t get a lot of time for the flavors to mesh together as they do while simmering in the traditional way. This becomes important when using sharp and pungent ingredients such as garlic and onion. Less is more. I will use a very small clove of garlic and a small slither of onion, and add more to taste. That way, you get a nice middle note without a sharp overpowering flavor. Alternatively, I will often use onion and garlic powders in place of raw garlic and onion as I have in this curried cauliflower soup. Start with 1/4 teaspoon, and add more to taste. You rarely need any more than that for a regular blender container-full of soup. Some raw vegetables like carrots, tomatoes, bell pepper, zucchini, corn, and peas are delicious added completely raw when making hot soups in the blender. Other ingredients like asparagus, mushrooms, potato, sweet potato, pumpkin, broccoli, and cauliflower need to be pre-steamed, sautéed, or roasted before adding to quick blended soups or they are just too assertive and taste downright disgusting and uncooked. I tried every trick in the book to make a 10 minute blender cauliflower soup from raw cauliflower and it just tasted horrible. It was like blended raw cauliflower water. Life is just too short. You will get the best results by steaming the cauliflower beforehand. Steaming cauliflower takes about 10 minutes in a large saucepan. I steam heads of cauliflower in advance in batches, and freeze the cooked florets with one head of steamed cauliflower in separate bags, so I can grab an exact portion when I want to make this curried cauliflower soup. That way, the soup takes less than 10 minutes to throw together for a quick easy dinner. Having steamed cauliflower in bags in the freezer is also fantastic for adding a creamy texture to other soups and sauces. The KitchenAid Pro Line® Series Blender heats soup in 5 minutes or less! 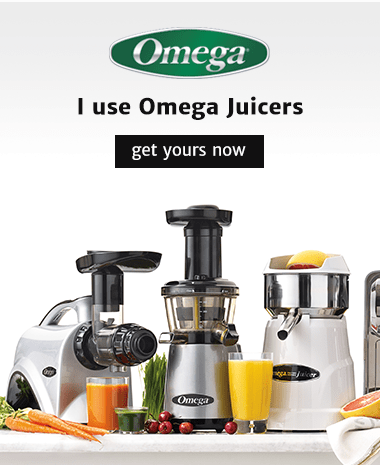 Many of you have asked me what is the best high-speed blender. For my money, I use the KitchenAid Pro Line® Series Blender to make all of my recipes. I own almost every blender on the market. I have an entire room full of blenders at every price point (true story), and my team and I test all of the recipes extensively on different machines so I can make the best recommendations, trouble-shoot queries that come in from readers, and ensure that the recipes are accessible to people blending with all kinds of machines. When we test recipes, we make several batches of a recipe, and line up blenders at similar price points to test performance and blend times. The KitchenAid® high-speed blender consistently blends ingredients quicker, and delivers an incredible creamy texture. When making hot soups from cold ingredients, this is where the KitchenAid® high-speed blenders shine. The upgraded model of the Pro Line® Series Blender comes with an insulated thermal control jar. This Adapti-Blend soup setting works with the dual-wall container to heat soup faster in 5 minutes or less. Other high-speed blenders heat ingredients in 5 to 7 minutes. Furthermore, the thermal control container keeps the soup hot. So, if you’re preparing a salad, toast or grains to go with the soup, or other courses for your dinner, just keep the lid secured on the container, and the soup will stay hot. It is just amazing. The insulated container works in much the same way as an insulated to-go cup. So, I love using this jar to make hot soups and hot drinks. Check out the hot chocolate, pumpkin spice latte, and matcha latte. Another really important feature to look at if you intend to use your high-speed blender to make hot soups from raw ingredients is the lid. Most high-speed blenders have malleable lids that have a lot of give. After regular usage (especially when put through the dishwasher repeatedly) the lids can warp compromising the seal. I have had lids pop off mid-way through blending a hot soup, and I’m not fond of Jackson-Pollock-style soup-on-the-ceiling-and-walls kitchen art. Seeing the lid wobble, spin, and move during blending makes me nervous. The KitchenAid Pro Line® Series Blender or High Performance Series blender both come with reinforced lids that are not malleable and don’t move. So, they enable a really firm and complete seal so you don’t have to worry about the heat popping the lid off. The base model Pro Line blender or the High Performance Series blender come with regular single-wall containers. These machines still have incredible power and will also heat the soup really well. It will just take a bit longer. If you have another brand of high-speed blender, blend until your soup is steaming. 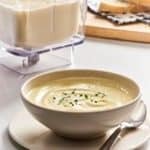 For those of you who don’t have a blender that heats ingredients, blend this curried cauliflower soup for 30 to 60 seconds until smooth and creamy, then transfer the mixture to a small saucepan, and warm it over medium-low heat for 1 to 2 minutes until piping hot. Whatever blender you have, do not miss making this curried cauliflower soup recipe. It is rich, creamy, and absolutely delicious. It has become one of my go-to winter soups. Soup will come out of the blender hot. Season with salt to taste, and garnish with finely chopped parsley or chives. Serve with crusty bread or a scoop of cooked grains.